2017 GB Issuance: USD155.5bn: New Record! All the 2017 numbers that count in our Green Bond Highlights report: Plus our Seven Super Trends and 2018 green bonds forecast! New annual record for global green finance. US, China, France lead Top10. New Issuers, new markets, use of proceeds on track & more numbers! Plus our 7 super trends to watch for in 2018 including our USD 250-300bn initial forecast for the full year. Lastly…A big shout for our 20th-21st March Annual Conference in London. Find out more here. Climate Bonds latest analysis for 2017 shows a December 31st tally of USD155.5bn, a new annual record, up 78% on the adjusted 2016 figure of USD87.2bn. Green Bond Highlights 2017 report shows the US, China and France led the way accounting for 56% of issuance between them. Germany, Spain, Sweden, Netherlands, India, Mexico and Canada filled out the remaining Top Ten positions. In the US, the largest overall issuer was Fannie Mae with a staggering USD24.9bn coming from its green Mortgage Backed Securities (MBS) programme – a volume so significant that it shifted the global market. 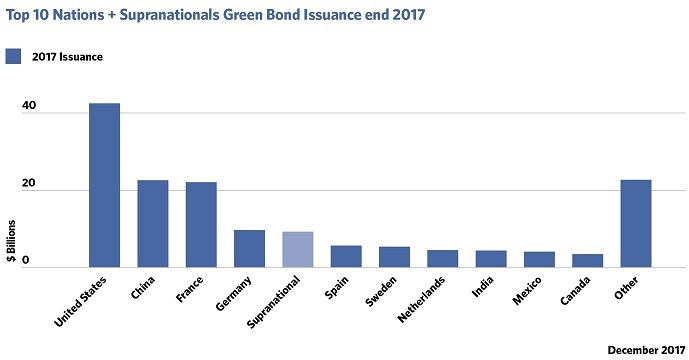 The largest single green bond placement originated from the Republic of France via its initial January 2017 for EUR7bn (USD7.6bn) issuance, part of its sovereign green bond program which ended the year at USD10.7bn following two subsequent taps. Next largest cumulative bond issuers for the year were China Development Bank (USD4.6bn), the supranational European Investment Bank - EIB (USD4.6bn), and sub-sovereign New York MTA (USD4.2bn). Just under 240 individual issuers came to market in 2017, of which 146 were debut issuers reflecting a widening of the issuer base each year. Issuers came from 37 countries. There were 10 new entrants: Switzerland, Argentina, Slovenia, the UAE, Chile, Singapore, Lithuania, Malaysia, Fiji and Nigeria. In a signal of the country’s increasing commitment to comply with international best practice, issuance from China included Certified Climate Bonds from three giant state backed banks: Industrial and Commercial Bank of China (ICBC), China Development Bank (CDB) and Bank of China (BoC). Indian issuers more than doubled issuance volume to reach USD4.3bn and break into the 2017 Top Ten table. Major domestic Certified Climate Bonds issuance included state backed entities IREDA (USD300m), Power Finance Corporation (USD400m) and Indian Railways Finance Corporation (USD500m). 2017 also saw a consolidation of green finance directions in Brazil which maintained the highest national ratio of of agricultural and forestry based green bonds, new issuance from Colombia and Mexico, as well as debut bonds from local government in Argentina and a Chilean corporate. With the first three Green Sukuk from Tadau Energy (USD58.5m), Quantum Solar (USD236m) and Permodalan Nasional (USD461m), Malaysia is establishing a role as an innovator in green Islamic finance thanks to its incentives, including tax deductions on issuance costs of SRI Sukuk and leadership from the Securities Commission Malaysia. Investment in renewable energy continue to be the most common use of proceeds, however their share has dropped considerably from 38% of volume in 2016 to 33% in 2017. Allocations to low carbon buildings and energy efficiency rose 2.4 times year-on-year and accounted for 29% of 2017 use of proceeds up from 21% in 2016. With a multitude of rail and urban metro deals, allocations to low carbon transport almost doubled in volume. The trend to finance an increasingly diverse range of projects continues. Waste, Land Use, and Adaptation themes continue to be the smallest, in part due to a lack of clear definitions on which project types qualify. You can read more in the full Green Bond Highlights 2017 report. Increasing international alignment and market harmonisation will result in more green investment in China and the greening of the Belt and Road will also gather wider significance. The Indian market will continue its growth with the government’s ambitious renewable energy policies and regulatory reforms providing impetus. More brown-to-green financing initiatives will emerge from global energy suppliers and the large emitters as institutional investors look for corporate business plans and hence balance sheets to be increasingly geared towards the achievement of the Paris targets and the wider clean energy and low carbon transition. Following the initial sovereign issuance from France, Fiji and Nigeria, the door is open for G20 and OECD countries to act on individual sovereign issuance in 2018 and provide stakeholder or supranational support for similar initiatives and market development in emerging economies. There’s now three vital years to reach the M2020 milestone of a trillion dollars in green finance by end 2020. The final results for 2017 provide some foundation, but must be doubled and doubled again by the end of the decade. After staying flat for three consecutive years, CO2 emissions are forecast to rise around 2% in 2017: Current climate action and investment is not on track to limit global warming to below 2°C, let alone the coming ratcheting up of ambition towards 1.5°C. 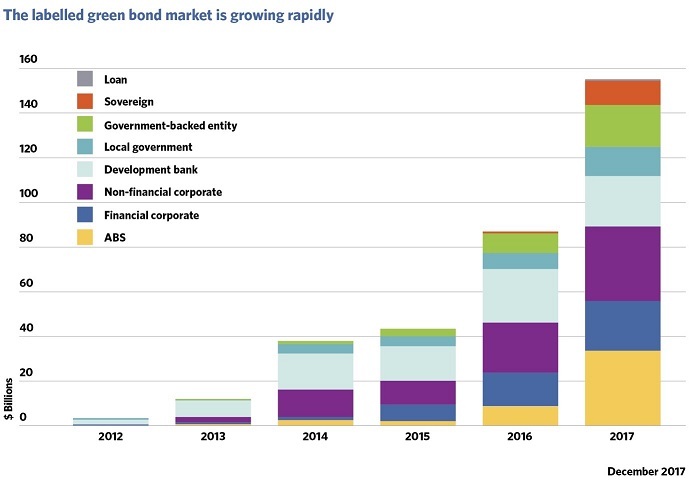 Despite 2017 being a positive year, for global finance and its actors to be making a substantial impact on climate targets, we estimate that the green bond market needs to reach USD1tn by 2020. More sovereign issuance from developed and emerging economies as more governments look to finance climate resilient infrastructure and achieve their NDC commitments. The pioneers from 2016 and 2017 will be case studies to encourage new entrants. Progress on common international standards and definitions for green bonds, with the launch of a European Taxonomy for sustainable finance expected in H1 2018. Sub-sovereigns will continue to push the market forward spearheaded by US Municipals – our 2018 estimate for US Municipal green issuance is $20bn. US Agency MBS and REMIC will also play a part. Regulators will keep innovating with more guidelines, regulations and incentives being put in place. European Commission consideration of lower capital requirements for lending against energy efficient buildings and electric cars is an example. Pressure to grow on the banking sector to lift their green lending and investor pressure on the world’s largest corporate emitters to demonstrate more brown-to-green financing to help meet Paris targets. Increased linkage between green bonds, and SDGs, particularly as a source of finance for goals 6,7,9,11,13 and 15. Our forecast for 2018 is USD250-300bn. That means at least 60%+ growth on 2017 figures. But the aim is to keep doubling labelled issuance volume to top USD1tn by end 2020. Is USD250-300bn in 2018 being too optimistic? Our high expectations about increasing green bond volumes are shared. Out of all possible bond types, DCM Heads of 20 of the top investment banks are most optimistic about SRI/green bond volume, according to recently published results from Global Capital’s 2018 outlook survey. PS: Have you put the Climate Bonds Annual Conference 20th-21st March in your Diary? Take up our special early bird registration offer. Open till 31st January. Don’t miss out!